Here is an excerpt from the new story, ‘Black Smoke and Water Lilies’ by David Jon Fuller. We love this story, and are very excited to have a new author join the Insignia Series. Welcome David!! I am born in the Valley of the Forest Monastery. It is a time of invasion. I am five years old. My name is Quick Stream. I sit on the fence that pens our pigs while my father and mother work in the fields. The mud stinks a familiar stench; earth and slop and excrement. The sun is bright; it is summer. The mountains surrounding the valley still have snow covering the tops. My father has told me to keep an eye on the pigs, but to face away from the sun and watch the pass to the west. It is called the Way of Black Sorrow. At seventeen years old, I remember watching the Way at five and tremble, for once again smoke blows through from the far side of the mountains; the marauders have returned. At seventeen I am safe behind the walls of the monastery, but I tremble nonetheless. I am eleven years old. I live with my father’s sister and her husband. He is unwilling to share his home. I am old enough to work but not to be asked to leave. When the harvests are poor, he yells at me. Perhaps he thinks it is my fault. I don’t know what to say, so I leave until he has tired and gone to sleep. The trees are not thick around the foot of the mountains, but many evergreens grow higher up. The woods whisper in the wind. The sound is soothing, and it helps one to forget. At times, I see young monks wandering silently between the trees—they are holy men; they tread softly on the earth, listening to the whispers. They are men of peace, but all know they have trained long to defend their monastery. At eleven I have heard that they are fearsome in battle, as flowing in their movements as the sapling in the wind, but hard as oak when they strike. I hide and wait, and watch one as he passes. He does not look up; he gives no sign of noticing me; and yet it seems he expects me to be here. At eleven I do not understand how he can know this. 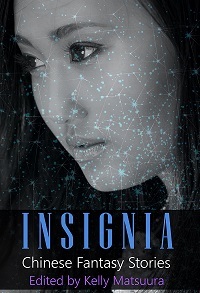 Want to write for the next Insignia anthology? If you already own a copy of Insignia: Chinese Fantasy Stories, you should be able to get an updated file for FREE from your ebook distributor. Please check your account/library for this option. Insignia: Chinese Fantasy Stories is now available on Smashwords. Download a copy in your preferred format! Smashwords also distributes books to ibooks, Barnes &Noble, Scribd, Oyster, and several other ebook sellers. It take a little time for books to be listed on this affiliates sites though, so we’ll add those links to the Insignia Vol. 2 page as they become available. Here’s a short excerpt from the new anthology, Insignia: Chinese Fantasy Stories. The Great Qilin is a Young Adult piece, one of three in this anthology. I dreamed of a most strange beast; part-dragon, part-horse, part-lion. It flew down from the evening sky, trailing a blaze of fire behind it and landed with surprising grace before me. In my vision-state I was still dressed in my favorite pink pajamas; my feet bare and chilled by the damp lawn where I stood behind my house. I was not physically present, but I felt the wind, blinked at the bright moon, and smelled the subtle musky scent of the visiting creature. “Ting Sun,” the beast spoke my name. I trembled, in awe, not fear. I had the gift to communicate with earthly animals, and they sometimes spoke to me in visions, but it was my first experience with one of the three heavenly creatures: dragon, phoenix, and qilin. “I am,” I answered with a parched throat. I straightened my back and neck, preparing to receive an important message or task. Me? Ride a qilin? I had never heard of such a quest, but it filled me with excitement. We traveled through the starry sky, soaring over the land and waters of Yunnan province, heading north. I gripped the qilin’s mane with one hand, the other I trailed through its flaming fire. It didn’t burn at all and I thrilled at the multitude of colors trapped in each thread of flame. I examined the qilin’s body with great interest. The size of a large lion, it was, however, covered in the scales of a dragon. Beautiful, pearl-like scales in the lightest shade of blue. Its thin mane was a darker blue and finished at the top of its shoulders like a horse’s does. Two horns of smooth black ivory curled outwards and up, resembling those of an ox. Below me, mountains and deserts passed by. Where were we going exactly? We were still in China as far as I could tell, but I had never before left Yunnan so was unfamiliar with the landscape we crossed. Thank you for reading! 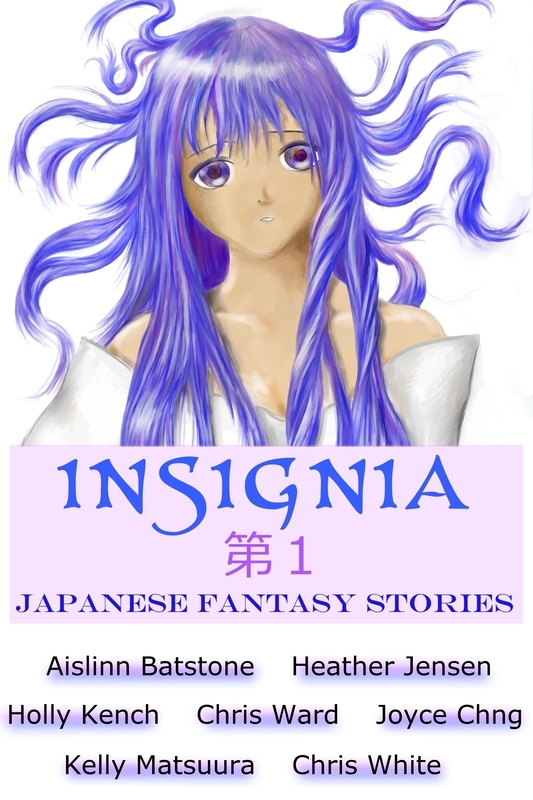 Please visit the Insignia Vol.2 page for more details and to-buy links. This week, we’d like to share a few excerpt’s from the short stories in ‘Insignia: Chinese Fantasy Stories’. Joyce Chng contributed two stories to this anthology, both are Young Adult urban fantasy stories. The old man is watching me. A pair of brown eyes set in a face crisscrossed with wrinkles. His hands rest somewhat elegantly on the walking cane knob. I blink. A dragon. The knob was carved in the shape of a Chinese dragon: curled beard, bulging pearl eyes and open-fanged maw. Mind you, he looks really nondescript. Your typical ah pek, out on a MRT jaunt, probably going to the kopitiam for a cup of kopi and coffee house politics. It’s the eyes. Dragon eyes. A tian lung is looking at me. I stare back, typical teenager bravado. And mind you, I am not ah lian material, either. The old tian lung smiles at me, baring his teeth–or lack of. Gold flashes at me. I close my eyes, pretending to listen to gothic metal. The joys of using an ipod. In my mind’s eye, in the aether that binds space and Myriad together, I confront the tian lung. “Far from home, old one,” I say politely. Respect your elders, even though they are not of your kind. Self-consciously, I look at my feathers. Gold, green and red. The blue is starting to come true. I am a late bloomer, unlike my sisters. The beeping of the closing MRT door startles me back into my human body. I blink. Uniform: check. Name-tag: check. Self: check. I watch the old man wave at me on the platform as the train pulls away. I am late for school. Thanks for reading! 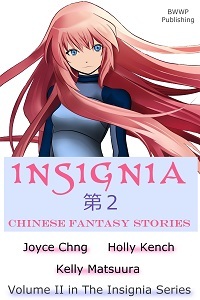 Further details and links are on the Insignia: Chinese Fantasy Stories page.